Spiders (order Araneae) are air-breathing chelicerate arthropods that have eight legs, and chelicerae modified into fangs that inject venom. They are the largest order of arachnids and rank seventh in total species diversity among all other groups of organisms. Spiders are found worldwide on every continent except for Antarctica, and have become established in nearly every ecological niche with the exception of air and sea colonization. 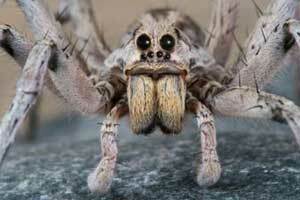 As of 2008, approximately 40,000 spider species, and 109 families have been recorded by taxonomists; however, there has been confusion within the scientific community as to how all these genera should be classified, as evidenced by the over 20 different classifications that have been proposed since 1900. Most spiders will only bite humans in self-defense, and few produce worse effects than a mosquito bite or bee-sting. Most of those with medically serious bites, such as recluse spiders and widow spiders, are shy and bite only when they feel threatened, although this can easily arise by accident. Funnel web spiders' defensive tactics are aggressive and their venom, although they rarely inject much, has resulted in 13 known human deaths. 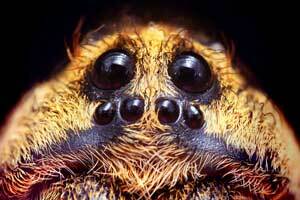 On the other hand the Brazilian wandering spider requires very little provocation. 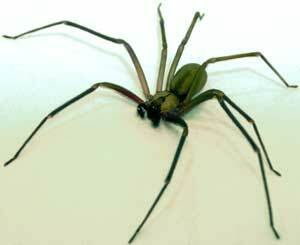 Brown recluse spiders are usually between 6-20 mm (¼ in and ¾ in), but may grow larger. They may be brown, gray, or a deep yellow color and usually have markings on the dorsal side of their cephalothorax, with a black line coming from it that looks like a violin with the neck of the violin pointing to the rear of the spider, resulting in the nicknames fiddleback spider, brown fiddler or violin spider. As indicated by its name, this species is rarely aggressive. Actual brown recluse bites are rare. The spider usually bites only when pressed against the skin, such as when tangled up within clothes, bath towels, or in bedding. Many human victims of brown recluse bites report having been bitten after putting on clothes that had not recently been worn or disturbed. In fact, many wounds that are necrotic and diagnosed as brown recluse bites can actually be methicillin-resistant Staphylococcus aureus (MRSA) or simple staphylococcus infections. Other causes include skin cancer, Lyme disease, and other infected insect bites and skin lesions. Brown recluse bites may produce a range of symptoms known as loxoscelism. There are two types of loxoscelism: cutaneous (skin) and systemic (viscerocutaneous). A minority of brown recluse spider bites form a necrotizing ulcer that destroys soft tissue and may take months to heal, leaving deep scars. The damaged tissue will become gangrenous and eventually slough away. The initial bite frequently cannot be felt and there may be no pain, but over time the wound may grow to as large as 25 cm (10 inches) in extreme cases. Bites usually become painful and itchy within 2 to 8 hours; pain and other local effects worsen 12 to 36 hours after the bite with the necrosis developing over the next few days. Serious systemic effects may occur before this time, as the venom spreads throughout the body in minutes. Mild symptoms include nausea, vomiting, fever, rashes, and muscle and joint pain. Rarely more severe symptoms occur including hemolysis, thrombocytopenia, and disseminated intravascular coagulation. Debilitated patients, the elderly, and children may be more susceptible to systemic loxoscelism. Deaths have been reported for both the brown recluse and the related South American species L. laeta and L. intermedia. Other recluse species such as the desert recluse (found in the desert southwestern United States) are reported to have caused necrotic bite wounds, though only rarely. Western black widow spider or Western widow, is a highly venomous spider species found in western regions of the United States of America. The female's body is 14-16 millimeters in length and is black, often with an hourglass shaped red mark on the lower abdomen. The male of the species is around half this size and generally a tan color with lighter striping on the abdomen. The population was previously described as a subspecies of Latrodectus mactans and it is closely related to the northern species Latrodectus variolus. The species, as with others of the genus, build irregular webs, the strands of which are very strong. The female's consumption of the male after courtship, a cannabilistic and suicidal behaviour observed in Latrodectus hasseltii (Australia's redback), is rare in this species. 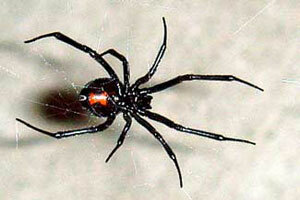 Male Western widows may breed several times during its relatively shorter lifespan. The ultimate strength and other physical properties of Latrodectus hesperus silk were found to be similar to the properties of silk from orb weaving spiders that had been tested in other studies. The ultimate strength for the three kinds of silk measured in the Blackledge study was about 1000 MPa. The ultimate strength reported in a previous study for Nephila edulis was 1290 MPa ± 160 MPa.